Sometimes transforming a garden just requires a good tidy other times you have to strip it all out and start again. I don’t very often get to see the transforming happening; less so these days. Sure I get the before and after pictures but to actually be on site helping; making a difference. This job was different; I went with Trevor to meet the client and measure the garden. 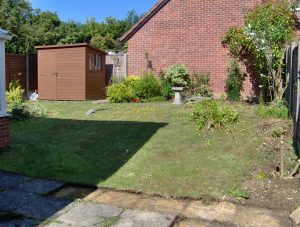 I tend to take a back seat and let him do his thing; ask the questions, make the suggestions; find out exactly how the client sees the finished garden. I struggle to see the end result but then I’m not the trained professional; I’m just the PA, labourer. 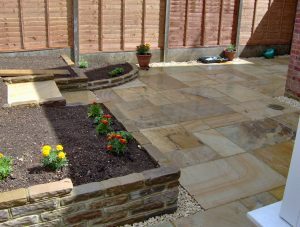 This customer knew exactly what she wanted: natural stone walling, steps, sandstone patio….the list went on. These days I was on site one day a week so when the works started I was there on day one. Starting work I had to stand back and think; wow this is going to take forever. 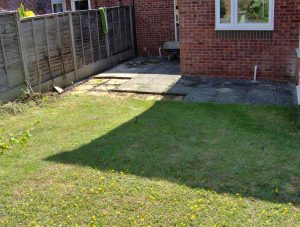 Digging off the old turf, taking up the old patio, clearing shrubs not to mention the barrowing it all to the skip in the front garden. Its all in the preparation I’m assured. Then the materials arrive so the reverse process starts; moving them all to the back garden. Oh no Trev’s back goes: there is nothing else for it I’ll take a week off and muck in. 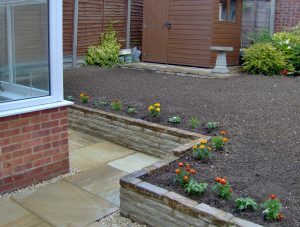 Barrowing and levelling tones of soil, pointing the patio; even laying a few slabs. I think the client was rather impressed. Thankfully the fence had already been finished as there are limits to what I can achieve; lifting fencing panels above my head isn’t going to happen. Then suddenly you stand back and go ok its looking good the transforming has taken place and the finishing line is in sight. I think this will always be one of my favourite gardens just because I put so much into it.